April has been an excellent spring month. Very little rain and some days have seen the temperatures up into the mid 20 degrees Celsius. If this is global warming then it wins our vote. We could do with a little more rain because the plants in the garden are being held back in their spring growth. With such good weather we've managed to get out and about and get so much done, but no worries there's always more to be done. Despite what the critics might say we went to see the Life of David Gale and although the ending is somewhat predictable it is still a very good story with a brilliant performance from Kevin Spacey. Early on in the month we hit upon the idea of creating a small stream or rill running into a pond. We found an old cast iron hand pump in a barn when we moved into the house and always had this idea of incorporating it into a water feature but there was a concern that it would appear to be a bit naff. 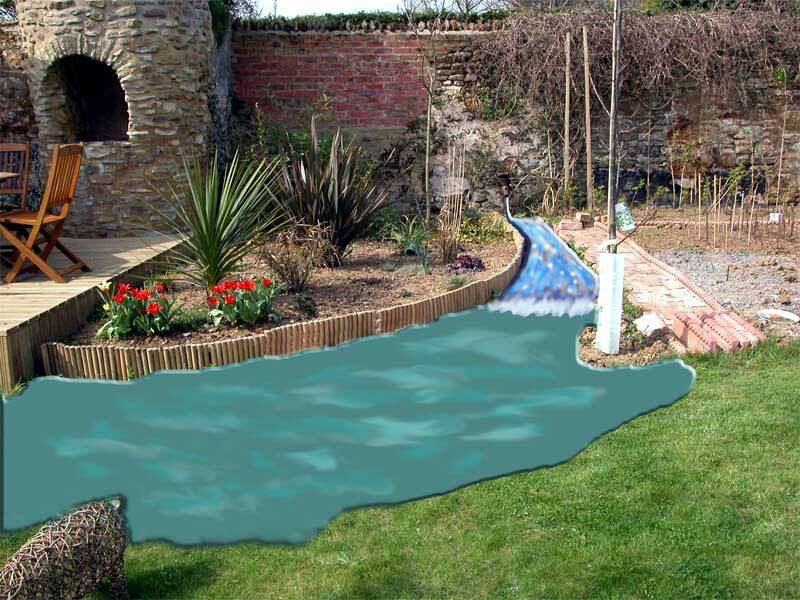 Our design places the pump against a wall so it isn't too prominent and the water will run between the vegetable plot and the grasses area next to the decking. We've started digging it out but we are wondering what to do with the earth... Steve has attempted a mock-up using Photoshop but it requires a little more work. We weren't sure whether Pierce Brosnan would have the acting skills to do a non action movie but we needn't have worried because he was very believable. He plays an ordinary man in the early 1950s who has his children taken away from him due to a strange Irish law and the power of the catholic church. The final victory of commonsense over the law and the church was superbly crafted. The film is based on a true story. 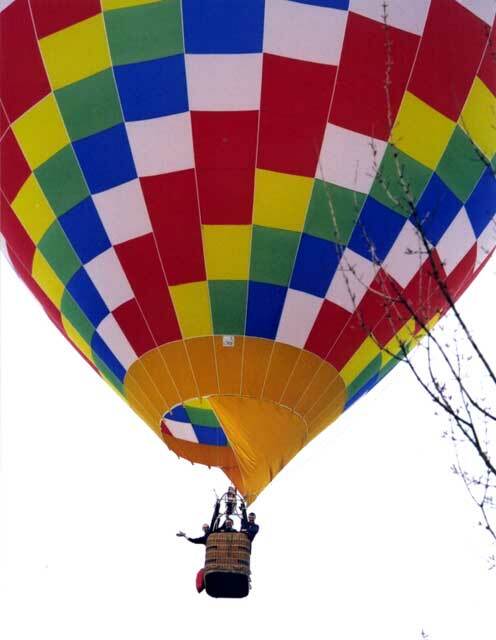 The ballooning season is upon us and with it comes a new balloon for The Ballooning Business. 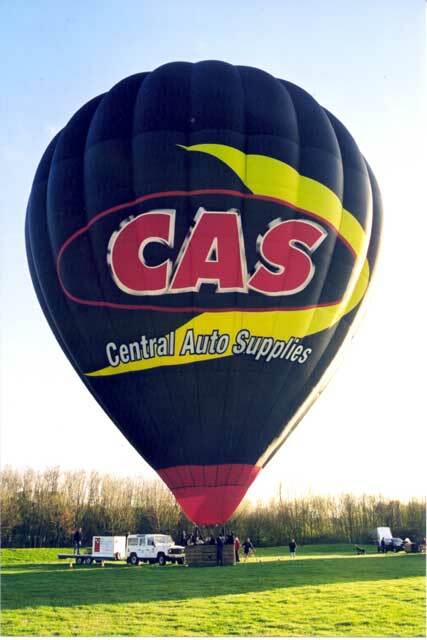 This is a Cameron 275 sponsored by Central Auto Supplies - CAS. We crewed a few times this month finding the larger balloon is heavier to pack away, it also sits on a longer trailer which makes reversing a little more challenging. Steve managed to turn into an enclosed area by the side of the road only to find he couldn't reverse round inside it and had to reverse out the way he came in. We feel sure there will be more interesting adventures to come in the near future. This was the third time we've seen the Counterfeit Stones which says something about the quality of the group. Not only do they sound like the Stones they also behave in character throughout the show. The act spans the early years from 1963 thru to 1980. While completing this page the real thing are playing Under My Thumb in the background. The older we get the more there is to reminisce and romanticise about. 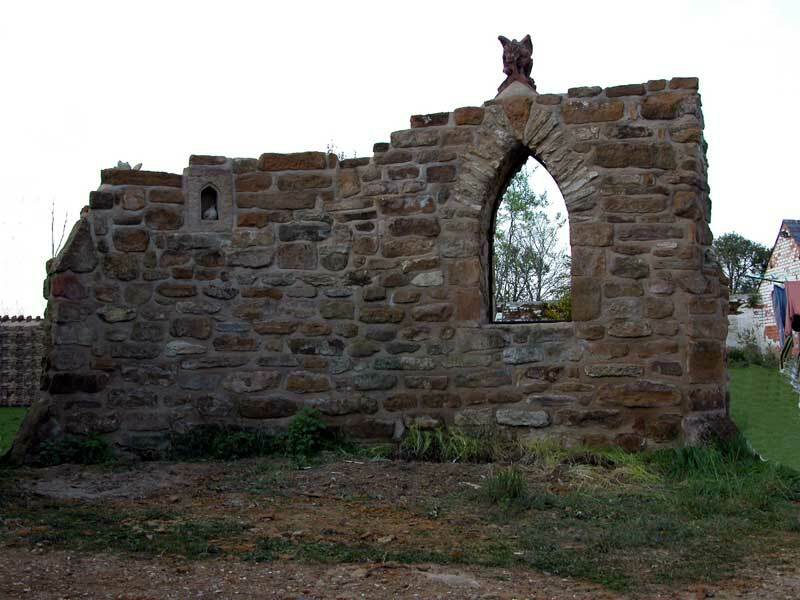 The ancient, ruined wall had become a labour of love, or should it be torment, in its building. The foundations were laid in late Summer 2000 and we slowly raised it to a point where the scaffolding had to go up and then it sat there for six months during the Winter. This month we had the topping out ceremony with a beautiful Victorian dragon ridge tile as its crowning glory. It looks as though it has been part of the scenery for hundreds of years but take a look at its infancy in May 2001. With such good weather this month it would've been churlish not to get our balloon out and give it a flight. As always on the first flight of the season Steve and Nick did some test approaches to make sure they were not too rusty. It was also an opportunity to give Paul, a new crew member, his first flight. Here we have Steve taking time out from a low level flyby to give the crew a wave. Of course Jane and Val were right on track in their pursuit so Jane could take the picture. It seems that whenever we fly out to the west of the county on the infrequent easterly winds we have a difficult landing and retrieve. This time it was an initially absent farmer and then when he did turn up he was drunk.